8:00 a.m. GMT: I thought I heard more shooting, but it was just thunder. A rainstorm blew in about half an hour ago. 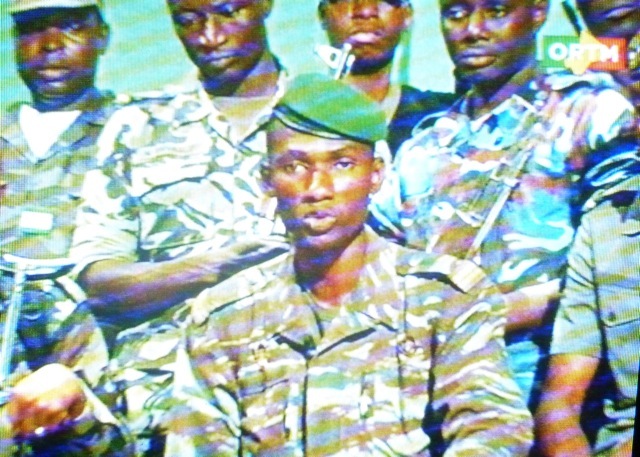 ORTM is broadcasting the same kind of folklore recordings it was playing the morning of March 22, but interrupts them occasionally with a communiqué by the CNRDRE junta, read in French by Lt. Mohamed Issa Ouedraogo. He urges Malians to remain calm. He says that an operation, mounted by Malian and foreign individuals of “various horizons” and backed by “obscure forces inside Mali” to destabilize the country has been defeated and that the CNRDRE remains in control of the situation. Ouedraogo says the army has killed and captured several men involved in this operation. 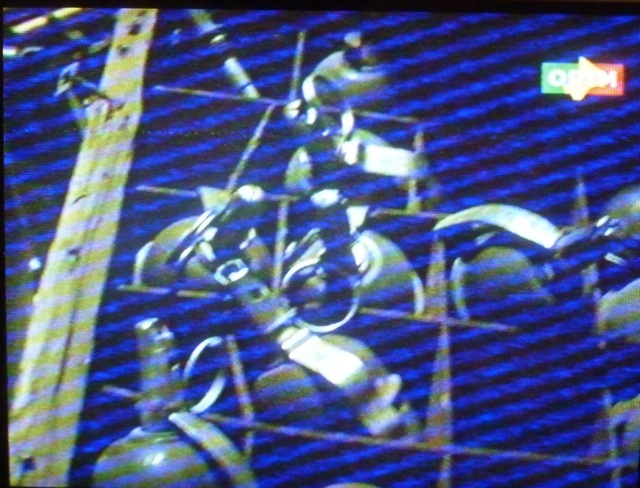 Images show young troops who appear to be prisoners in handcuffs, wearing camouflage fatigues with no insignia; the broadcast also shows images of weapons (assault rifles, hand grenades, a recoilless rifle) that may have been captured. Lt. Ouedraogo finishes the statement, attributing it to Captain Amadou Haya Sanogo, who has not been seen on television since the unrest began yesterday. 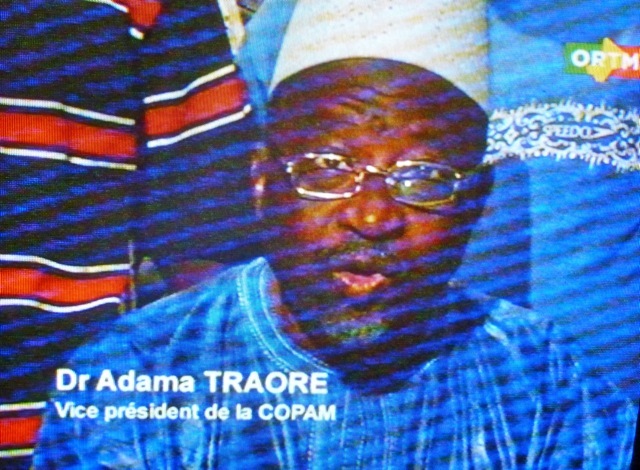 Next, wearing a blue boubou and white cap, appears Dr. Adama Traoré, Vice President of the Coordination des Organisations Patriotiques du Mali (COPAM), a pro-putsch umbrella group formed in the days after last month’s coup d’etat. Flanked by a couple of young men in street clothes, he gives a statement in Bamanan with the same content as Lt. Ouedraogo’s remarks. 9:00 a.m. GMT: The rain has subsided, not enough to wash the dust off the bottom-most leaves on the mango trees. So far there’s no information from any sources to contradict the CNRDRE claims of control, though one rumor claims that the junta has been broadcasting its televised message via an ORTM mobile unit and is not actually in control of the ORTM studio. I haven’t yet ventured out to assess the situation in my neighborhood, but everything seems calm. Al Jazeera English is backing up the junta’s position that a “counter-coup” has been successfully repulsed. 10:00 a.m. GMT: Just heard two simultaneous bursts of heavy machine gun fire, coming from two directions — north, near the Pont des Martyrs, and south, near the Pont Fahd. Sporadic bursts of rifle and machine gun fire continue emanating from the north. Not sure if it’s celebratory or actual fighting, but it doesn’t sound like the shooting we heard after the coup in March, which was all firing in the air. There’s a rumor in our neighborhood that foreign troops have been sighted in the city and that the shooting is by Malian forces engaging with these foreigners. I’m highly skeptical of these rumors. One big question is on my mind: Assuming the junta is back in control, what will last night’s attempted counter-coup mean for Mali’s political transition? During his phone call broadcast on Radio Kayira several hours ago, Captain Sanogo claimed that the country’s interim president, prime minister, cabinet and legislature were all safe and would continue to go about their work. I’m guessing, however, that in light of recent events, many troops loyal to Sanogo will have a serious bone to pick with interim President Dioncounda Traoré, on whom they will likely blame the recent instability and whom they have already accused of selling out the country to ECOWAS for selfish political gain. Rumors are circulating online that ECOWAS troops have entered Mali from the south, via the Sikasso region, and are heading toward Bamako. Foreign mediation of Mali’s crisis appears to be dead in the water at this point, as anti-foreign rhetoric has ratcheted up. Sanogo alleged on Radio Kayira that foreign mercenaries were involved in the unrest, and warned Malians to be on the lookout for unknown foreigners. I presume by this he means those who might be part of an ECOWAS intervention force. It’s hard to see how the junta and ECOWAS can get back to the negotiating table now, given how much positions on both sides have radicalized. Unnamed sources cited by Jeune Afrique indicate that interim president Traoré and prime minister Diarra are safe, and apparently not in military custody. 12:00 GMT: More bursts of gunfire audible from the northeast. Since they are few and far between, I’m going to assume that they are from shooting into the air rather than shots fired in anger. RFI is reporting red berets firing in the air in and around Djicoroni. But I’m still staying home today. Radio Kayira continues to rebroadcast Captain Sanogo’s telephone call from 12 hours ago on its airwaves. I’m unaware of any further contact with the captain since then and he has not yet appeared on television. 12:45 GMT: More shooting coming from the same direction, including the “boom-boom-boom” of heavy weapons. I’m wondering if I should revisit my hypothesis of shooting into the air. But so far media are still reporting that the fighting in Bamako and Kati is over, and that forces loyal to the CNRDRE junta won. 13:30 GMT: Jeune Afrique reports that junta troops have attacked the Djicoroni base that is home to the airborne regiment and presidential guard. A friend speaking on the phone with relatives in Djicoroni could hear the sound of heavy gunfire. ORTM television continues to air documentary programs, nothing at all about current events, and the ORTM’s two radio frequencies have also been broadcasting identical pre-recorded content. It seems that ORTM staff are not present in the studios, or at least not in sufficient numbers to produce and air live programs. 15:00 GMT: I phone a friend who works in ACI 2000, not far from Djicoroni. He says soldiers have been passing through the neighborhood on their way to attack the paratroopers’ base, and I can hear gunshots on the other end of the phone. There are still sporadic bursts of fire audible from my house in Badalabougou, still emanating from the northeast. AFP, citing hospital sources in Bamako, says the casualties so far include 14 dead and 40 wounded among military personnel on both sides. 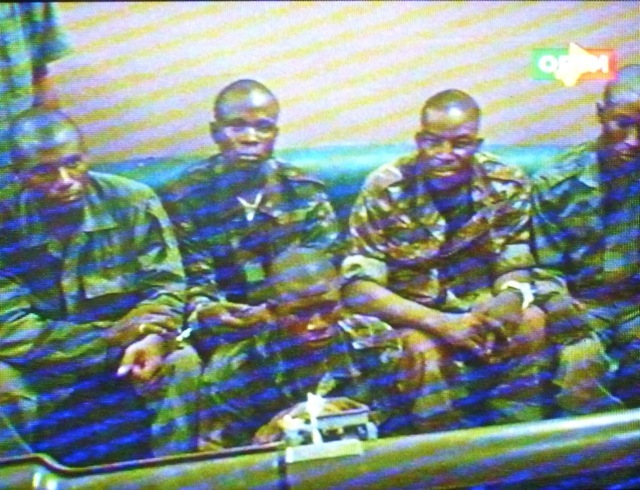 16:00 GMT: Captain Sanogo appears on ORTM television, shown with fellow junta officers in a salon. He describes the current conflict as having been set in motion by “ill-intentioned elements” that had been infiltrating Bamako in recent days. He continues to express his support for the “accord-cadre” signed with ECOWAS a month ago. Sanogo’s brief (2 min. 30 sec.) appearance is followed by a statement by Hamadoun Touré, minister of communication in the new civilian government. Touré urges Malians to remain calm and to strive for a definitive return of constitutional rule as well as a restoration of the Malian state on all Malian territory (including the north). I continue to hear sporadic shots from the northeast. Reuters reports that the Djicoroni Para base has been overrun by troops loyal to the junta, and that many red berets fled. 22:00 GMT: All quiet, no shots audible for some hours now. It seems the junta troops have reestablished control. I’d heard that soldiers had taken over the city’s two principal bridges over the Niger, but a friend who crossed the Pont Fahd four hours ago told me he saw no soldiers on or near it. The airport is closed and all commercial flights in and out have been cancelled until 7 May. Royal Air Maroc has suspended all flights to Bamako for the next two weeks. One of the two students wounded during yesterday’s police raid at the university campus reportedly died in hospital today, bringing the death toll of that operation to two. Something tells me my anthropology class won’t be meeting this week. Still nothing but canned programming on ORTM radio and TV, and no journal télévisé tonight. I’m also disappointed with Africable, which after airing some preliminary reports of unrest yesterday stopped covering the situation in Bamako altogether, and has since only aired news from other West African countries. The private network did the same thing after the March coup, broadcasting an early interview with Captain Sanogo before suspending local journalism for several days. Junta’s orders, perhaps? The Bamako newspapers were all mum today too, though it could simply be because of the holiday. The U.S. Embassy in Bamako has announced that it will be closed tomorrow due to “continued unrest.” I am hoping, however, that schools will reopen, as I am very much in favor of letting my children go bug somebody else for a few hours. If the calm persists, I think we have a good chance of that happening. Otherwise, I will be desperate to avoid another day of sheltering in place. 23:00 GMT: For what it’s worth, today has seen by far the most visits to this blog of any day since I started it in September: about 6,000 hits since midnight GMT, twice as many as the previous highest-traffic day (which was April 4, the day I wrote that Peace Corps was pulling its volunteers out). People seem to like it when I blog about bad news or the sound of gunfire. I can’t exactly promise to keep that stuff coming, however. In fact I can’t wait to get back to blogging about mundane bamakois life — higher education, gender relations, the Djakarta, the local martial arts scene…. For months I’ve been knocking around an idea for a post on the dojos of Bamako. But in light of Mali’s recent political trauma, the thought of writing about such things seems in poor taste. I’ll get to them someday, when all this is over and Bamako is again a rather dull place to be. Here’s wishing you had a happy May Day/International Workers’ Day/Organization of African Unity Day. 23:42 GMT: Damned if there isn’t more shooting breaking out north of the river. But I’m going to bed anyhow. This entry was posted in Uncategorized and tagged amadou sanogo, bamako, cnrdre, countercoup, coup, mali. Bookmark the permalink. Dear Bruce, this morning on Dutch television news broadcast: supposedly the fights are between Sanogo’s troops and elite forces supporting ATT. The Kati base was attacked, deaths have been reported, people are fleeing Bamako. Here also it’s confirmed that counter coup was not succesful. Actually, rumors (need to be confirmed) about the deployment of ECOWAS troops from Burkina in southern Mali (especially Ouelessebougou). Information about that? No confirmation, the rumors I saw circulated about 8 hours ago and I haven’t seen them repeated since. Thanks for confirming my suspicions. Hope Yeah is safe and sound! I agree with Adam! I check it every day and so do all of the other folks that I work with. Lassana’s family is in Djicoroni and hearing heavy gunfire right outside their door. We are on skype with them right now, and can hear the gunfire through the speakers. I just got word that the airport will be closed until the 7th of May. Anyone confirm/deny this? I haven’t heard about it. Air France would have been canceled flights then. I hope it will stay open. From my checking it looks like Air France is cancelled for today and tomorrow. ESF Travel in Bamako has just sent this same announcement out to its mailing list. I would consider them to be a very reliable source of information. Did you check that on the Air France Website? Yep, I just checked again right now and both the flights of May 1 and May 2 are listed as cancelled. But it appears that the airport isn’t closed, because Royal Air Maroc and others companies didn’t cancel flights. So it’s just Air France canceling. When you try on their website “Bamako Aeroport” to “Paris Charles de Gaulles” There’s no planes till the 6th May. But when you try the opposite “Paris Charles de Gaulles” to “Bamako Aeroport”there’s planes everyday till the 7th. So the airport isn’t close. A cauldron of confusion… Bruce, you note anti-foreign feeling, perhaps confined to Bamako as the capital and felt only towards ECOWAS and countries like Burkina. Any anti-Western, anti-American feeling? There’s been anti-French feeling here for a long time, and any toubabou can fall afoul of that. But I wouldn’t say there is anti-Western sentiment in general, or anti-American in particular. Thank you so much for this consistent, incredible insight. Stay safe! Bruce, what about the reports of two ECOWAS planes landing last night? Any more info abou that? No confirmation on that, John. A reader to this blog who told me he was in the hangar area last night from 1800-0000 GMT says he saw no planes land during that period, which is the only time the airport could have fallen into “counter-putschist” hands however briefly. Do you have news about the airport? I’ve heard it’s reopened (visibility is much better today than yesterday) but I have that from one indirect source and it’s not yet confirmed. Your source seems more reliable than mine. Living outside the capital we really appreciate your blog! Thanks for your insights and for taking the time to write them down. It helps a lot. We appreciate the SMS’s from the US Embassy but…in terms of information they don’t give a whole lot to go on. Your blog gives us a bigger picture. Keep writing! Since most of the counter coups folks – red berets etc. – fled, can it really be considered over? The counter coup forces are still out there and can theoretically reorganize and try again. I think that’s what the CNRDRE is trying to confront now in assaulting the paratrooper base in Djicoroni. Yah, and blocking all the bridges. But it seems that all the red berets have ran away from the paratrooper base in Djicoroni already. Thus, they could regroup somewhere else at a later time. I have a feeling ECOWAS and D. Traore have their hands in this coup attempt. I’m sure your hunch is shared by the junta. What do you know about the red berets having withdrawn from Djicoroni? I always had a feeling that the junta and D. Traore would have a face off at some point. They don’t trust each other and I don’t think they really like each other. I imagine D. Traore told ECOWAS at their last meeting all about how Sanogo is intimidating and controlling the so-called “transitional gov’t”. ATT has definitely played his role in this coup also. We will find out more when things become clear with the mercenaries. And remember, ATT is alive and well in Dakar with great phone commication. He is friends with the heads of ECOWAS and I am sure he is advising them daily. But do you see ATT angling for a return to power here? I can’t even imagine that after everything that’s happened since March. I think the problem with him returning to power now is the population seems against him at this point. Perhaps if things in Mali with Sanogo go even worse and the population see him for what he is (a disaster for Mali – North and South) they could theoretically see ATT return as a kind of hero. Things would have to get pretty bad for Malians to long for the days of ATT’s rule! I just don’t see it happening. I agree it seems hard to believe but ya never know. It certainly isn’t impossible. I mean, who could have imagined the condition Mali is in today? Allah ka Mali deme ka kissi gere gere ma. Sanogo ma nyi. Allah nye be fen bee la. Ni mogo be fen jugu ke dje kono a be sege ale yere ma. A bi ben ni Allah sonna ma. I must say, I was hopeful that the coup would work today. Kinda disappointing Sanogo still in power for moment. Sad. i found your blog through a Facebook contact, with no idea that you and your family were in Mali. May the Creator bless you and your family and keep you safe during such challenging times.I have now read all your archives and am so grateful for such an immediate source of information on a country I love with my whole heart. I’ll be following your posts daily. In case the airport issue still is a question, I received notification from ESF Travel today that the airport is closed until May 7th. No flights in or out. I’ve seen the same thing reported elsewhere as well. thanks for your always informative posts, bruce. all the best to you and your family. our hearts go out to all in mali la during these troubling and uncertain times! if you think of it, please post your entries directly to the Facebook group, Americans and friends in Mali, we all appreciate it! Can I do that without being on Facebook myself? Cause I don’t have an account and I’m not getting one. They can’t make me. i think it’s connected to the same web as wordpress. hence links are easy to make. stay well and thanks for all the info! quick update: bruce — many folks on the americans and friends in bamako FB group are thanking you for your reporting. well deserved! Your blog was linked in a FB post a few weeks ago from our daughter-in-law who had left Mali during the authorized departure with their children. I’ve been following your posts because our son is still there and you give a clear-eyed analysis of what is transpiring. We visited our family last October and treasured our time in Mali. This is so sad for the people. This would not be a bad time to write about dojos, actually, since you’ve got us hooked, and everyone here loves Mali, even if vicariously, as in my case. What ARE dojos? Simply said, thanks very much Bruce. It is a complete shame Mali is in such shambles. Hopefully this mess is settled soon and we all can come to Bamako and thank you in person. Bruce, I want to hear about the martial arts scene and dojo! With photos! I am trying to understand this quote because I believe most people want good news over bad news. Or as humans, do we just like exaggerated, half true, or reading about other people killing each other? Bruce, please report the reality of Mali. You are not a “journalist” and that’s why I would rather read your blog than listening to RFI or reading Jeune Afrique. I’m merely remarking on the correlation between bad news and hits on my blog. On days when I report good news or “normalcy” the blog receives far fewer visitors than on days when I write about bullets flying. It goes back to the old journalistic aphorism, “If it bleeds, it leads.” I do think people are more interested in reading about crises and violence than peaceful everyday existence. I strongly believe that 90% of the visits you received lately are from relatives concerned about their family members, trying to get any kind of information on what’s happening, or from people that live in Mali and are as tense as you are, digging the net for some solid piece of intel. That’s my case, I live in Badalabougou as well and your blog, even if it’s not your intention, has become a reliable source of orientation. And I thank you for that. By the way, I heard that there’s shooting on the Sebenikoro area right now. Here in Spain we wait your comments. My husband is now in Mali, with his flight cancelled twice (for the harmattan and for the last events.) We hope that will be finish soon, we think in all of you. Bruce, I’d like to set the record straight for my own sudden and unrelenting interest in your blog by saying that it has nothing to do with any voyeuristic interest in reading about bad news. There’s far too much sesationalized bad news available elsewhere. Rather, my daughter has been working in Bamako for the last 10 days for an NGO trying very hard to provide relief to the people displaced in the north. Since there are a considerable number of foreign nationals putting themselves at similar risk in Mali, I suspect that a considerable percentage of the surge of interest in your writings is coming from family members like me who are worried sick about the recent scary developments and are desparate for news….and preferably of the good variety. So please keep up your excellent work, just try to keep in mind there are many tender hearts hanging on every word.